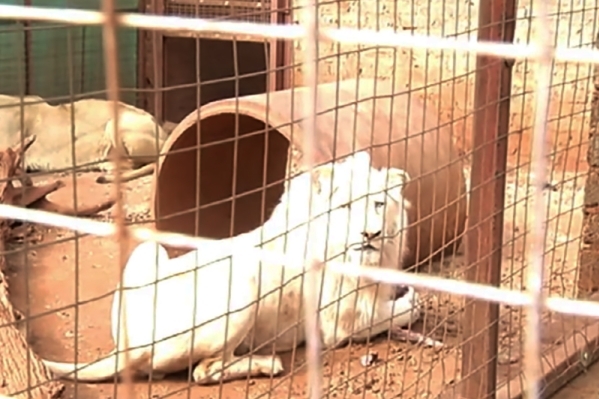 A rare white lion who faced being auctioned off and shot by hunters may have been saved by a mystery donor. Mufasa, three, was confiscated by police in South Africa as a cub and handed to a wildlife rehabilitation centre to be cared for along with another young lion called Soraya. The rare big cat is infertile and so faced being put up for auction with activists and staff at the sanctuary fearing that he would be bought by hunters. However, a lawyer for the sanctuary has revealed that he is now in negotiations to buy Mufasa, together with Soraya, on behalf of a mystery donor who wants to move them both to a safe haven. 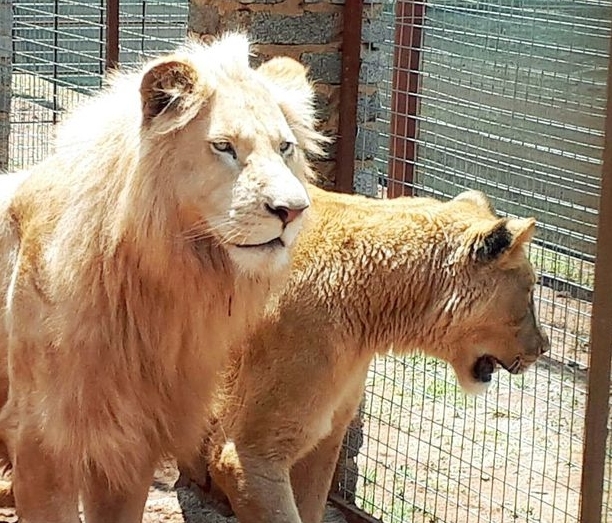 Mufasa was taken to the Rustenburg Wildlife Rehabilitation Center as a cub after being taken from his owner who kept him as a pet without a permit. He is set to be auctioned off, a practice that is common with confiscated animals. However, there are fears that he will be bought by a hunting group who will force him to take part in a 'canned hunt'. 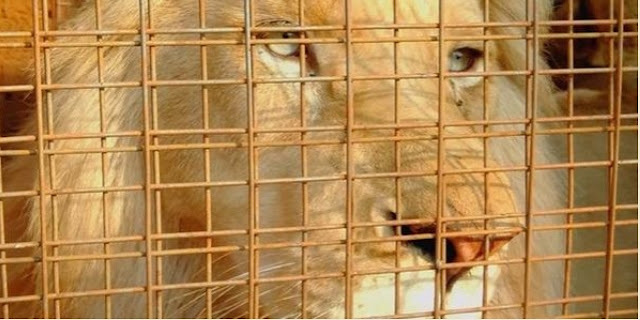 A canned hunt sees an animal trapped in a confined space and then shot by hunters. Carel Zietsman, the lawyer for Mufasa's sanctuary, told ABC News on Tuesday that he is in negotiations to buy the lion and Soraya too. He added that the two lions have emotionally bonded and that Soraya wasn't eating before she met Mufasa. Staff fear that separating the lions could lead Soraya to starving herself. He said: 'I cannot give you too much detail at this stage as the negotiations are in a sensitive stage but we're hopeful that we'll be able to buy Mufasa and Soraya and relocate them somewhere safe. Activists want the three-year-old lion to be moved to a sanctuary and more than 230,000 have signed a petition amid a huge worldwide campaign to save him. But because the animal is infertile, he would be of no interest to a breeder and campaigners fear the only value he would have is to be bought by a hunting company. 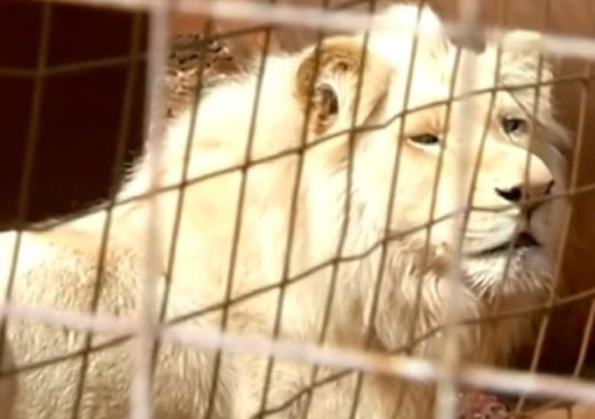 South African authorities are said to have agreed to put the animal up for auction. There are understood to be fewer than 300 white lions in the world - and only 13 left in the wild, according to a letter accompanying the petition. 'Nature conservation officials refused permission for Mufasa to be relocated to a sanctuary, who offered to care for both Mufasa and Suraya for their natural lives, free of charge,' said the letter to South Africa's Minister of Environmental Affairs. 'Instead, the rehab centre was told telephonically that Mufasa will be auctioned to raise funds for the department. The letter continues: 'Mufasa has had a vasectomy and is no longer able to breed and is therefore of no interest to a breeder. The only commercial value he has, is to be hunted in a put and chase hunt, otherwise known as a canned hunt.' According to the Mirror, the Wild for Life sanctuary has cared for Mufasa for the last three years and has already raised more than £6,000 for a court battle to block the auction. It wrote: 'In the last few weeks we have seen and read extensively about what happens to lions in the industry. 'Mufasa has had a vasectomy and cannot be bred with. This means there is only one of two options left. Responses to "Mystery donor to save rare white lion from becoming hunting trophy"
This Majestic Animal Should Not Be Killed Under Any Circumstances ! Thank you! Trophy hunting should be illegal!! Why on earth does anybody want to kill such a majestic being. Bloody cowards and should be fed to them! Not worthy of even being labelled "human". to whoever wants to kill these magnificent creatures.may you & your entire family be forever cursed with disease and horrific deaths.this is not hunting this is slaughter just for the sake of it !..